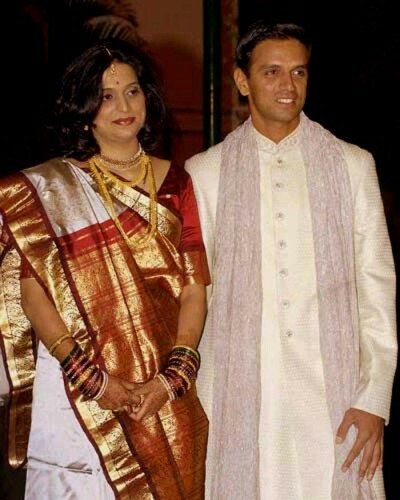 Cricketer Rahul Dravid poses along with his bride Vijeeta Pendharkar after their marriage in Bangalore 04 May 2003. Dravid, vice captain of the Indian cricket team, got married to Pendharkar earlier in the day, according to Hindu rituals at a temple on the outskirts of the city, were attended by close friends and family members. They have two children: Samit, born in 2005, and Anvay, born in 2009.